Griffin Mill Lock on the Thames & Severn Canal near Thrupp now has a full set of gates. An impressive crowd of local people gathered on the tow path to witness this historic event on Tuesday 1st July. The historic element of the day was foremost in the mind of Robert Paget. 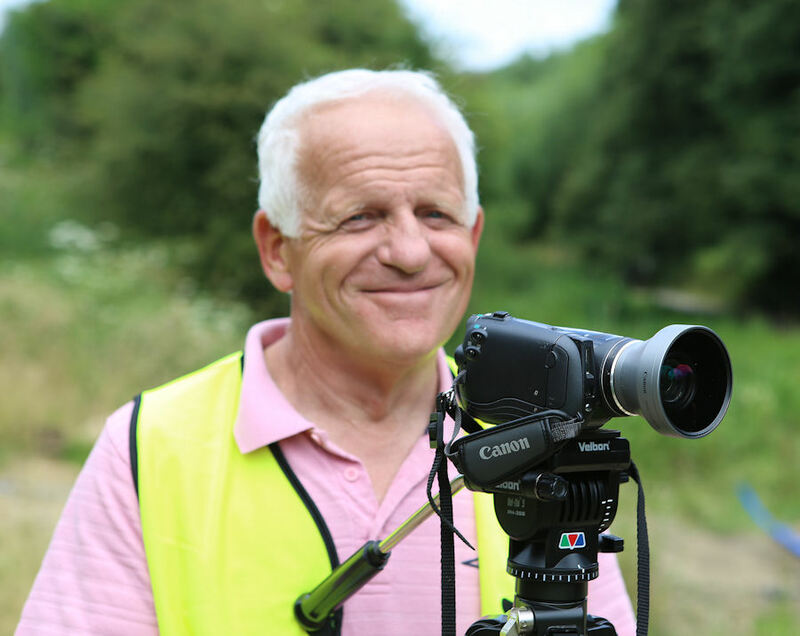 Robert was a volunteer at Griffin Mill Lock in the early days of the restoration. He took the second picture in 1974! Griffin Mill Lock is the middle lock of what has become known as ‘The Three Locks Project’. The three locks to be restored are Bowbridge Lock, Griffin Mill Lock and Ham Mill Lock. Uniquely, the work is being carried out by volunteers working alongside professionals. 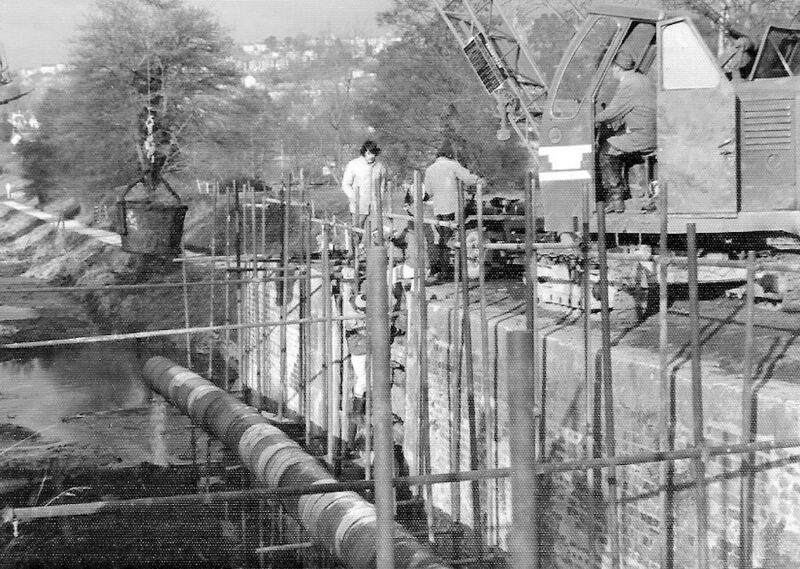 The volunteer teams involved in the project include Cotswold Canals Trust members, local people who have joined the Stroud District Council volunteers and members of the Inland Waterways Association’s Waterway Recovery Group. The lock gates were custom built by Hargreaves Lock Gates of Sowerby Bridge, Yorkshire using a sustainably sourced West African hardwood known as Ekki. The large bottom gates weigh 3 tonnes apiece while the smaller top gates weigh 1.5 tonnes each. The professional expertise to crane the gates into place was provided by Gloucester based Ellis Cranes. Somewhat unusually the Griffin Mill lock gates will remain unpainted. The reason behind the ‘au naturel’ look involves neither aesthetics nor cost saving. It is simply that the immensely dense, rich maroon coloured hardwood, simply will not absorb the paint normally used to coat lock gates. However, tradition has dictated that the balance beams have received a coat of very special black & white micro porous paint. “Newbury Working Party Group (NWPG) will arrive on Saturday 5th July for the first of a number of week-long Waterway Recovery Group Camps. "They will undertake the removal of the upper and lower bunds (dams) across the canal. 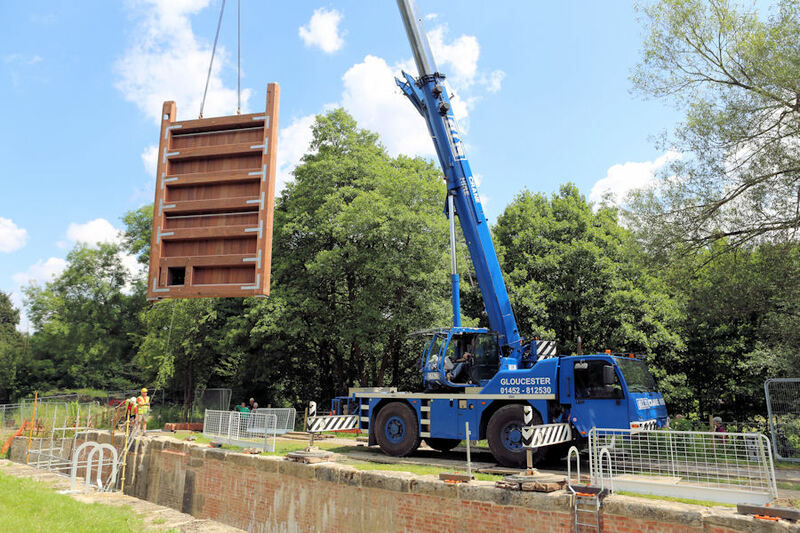 A number of NWPG volunteers are qualified to operate the 8 tonne and a 3 tonne excavator and two 3 tonne dumpers to remove and spread some 800 cubic metres of material from the canal." Even the paddle gear is the result of the expertise of CCT Volunteers working alongside local companies. CCT Engineering Director Jim White researched and designed the paddle gearing. The assemblies were cast at DM Foundry in Chalford and finer machining processes were carried out by Truturn Engineering in nearby Thrupp. CCT Volunteers at the Trust’s Eastern Depot near Cricklade have produced the timber ‘jack-posts' upon which the paddle gear is mounted. 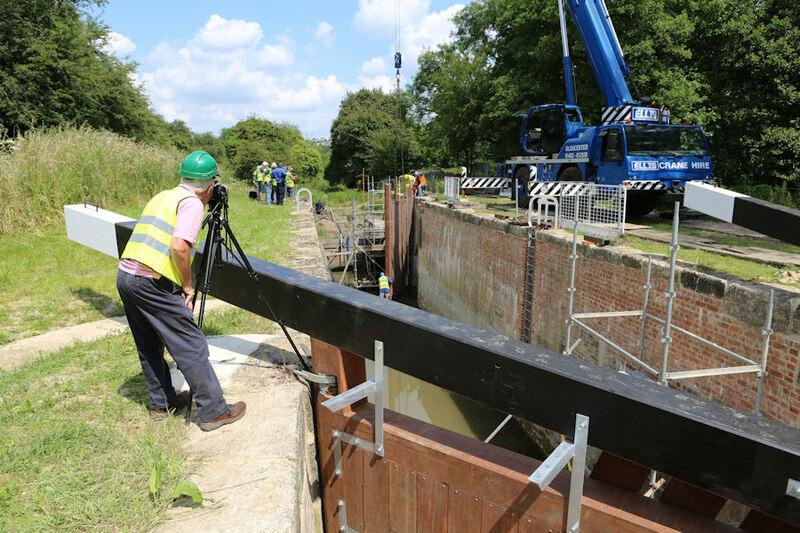 Nigel Lord of Hargreaves Lock Gates expressed his admiration for the entire team saying…”I am astounded that a group of people who do this just for the love of it can get so much done” Praise indeed! Click here, and then on the green icon, to find out about being a CCT Volunteer.